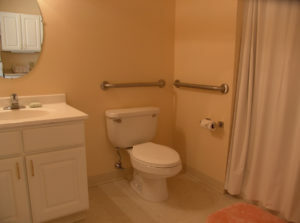 Senior Care Wolfforth TX: How Complicated Is Bathroom Safety? The bathroom is still the most dangerous room in the house, especially for your aging family member. As her caregiver, you might be worried that keeping her safe in the bathroom is something that will be incredibly expensive and really complicated. But this doesn’t have to be a complicated process at all. Your best tool in keeping your senior safe no matter where she is can be your own common sense. Think about what she may have told you about how she feels when she’s engaging in certain activities in the bathroom. Watch what your senior needs and how she moves in other rooms, too. From there, you can spot areas that aren’t working as well for her as you would like for them to work. It can also help to start with your senior’s limitations. If she has a difficult time standing from a seated position in the living room, she’s likely to have that same problem everywhere. Using a toilet raising kit to lift the height of the toilet can help her immensely. Her own challenges can help you to spot safety concerns. Regardless, some tools are always helpful. Handrails in particular fall into this category. Your elderly family member can use them to maintain her balance and they’re an excellent assistance tool if she feels she’s about to fall. Installing hand rails in the shower or tub stall as well as on other walls in the bathroom can help your senior to feel more secure overall. Often caregivers look at shower stalls or tubs and worry that nothing short of a complete renovation will help their senior to be safer there. The reality is that there are a lot of tools that can help more than you might think. Transfer benches and shower chairs can help to make a tub or shower stall far safer and more accessible than you realize. Do some investigating before you worry that there’s nothing else that can be done. Senior care providers might be the right answer for your senior’s situation. They can help her to deal with the everyday tasks that go on in the bathroom. But they can also help you to determine what changes might help your elderly family member to be more independent in the bathroom. If you or an aging loved-one are considering Senior Care in Wolfforth, TX, please contact the caring staff at Best In-Home Care (806) 412-0723.